The Energy and Environment Cabinet’s Division of Waste Management is sponsoring waste tire amnesty events across Kentucky, meaning Kentuckians can drop off unwanted tires free of charge. The Spring Waste Tire Amnesties’ numbers are in, and it appears the numbers of tires being brought in have continued to drop thanks to the new three-year Area Development District (ADD) rotation schedule and the visits being made to tire merchants by Ricky Solomon and J.R. Holt prior to the amnesties in order to check on stockpiles of waste tires. 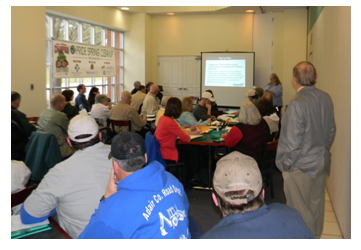 The Recycling Assistance Section (RAS) has been very busy during the month of March speaking to affiliates of Eastern Kentucky Pride during their annual spring cleanup meetings held in Hazard, Columbia, London, Catlettsburg and Prestonsburg. RAS members Rick Solomon, Cathy Guess, Tom Heil, Shannon Powers and JR Holt explained each of the section’s programs—e-Scrap, Recycling Grants, Household Hazardous Waste (HHW) Grants, Medical Waste and the Waste Tire Program. Meeting attendees found out about the “All-Agency” e-Scrap recycling contract that the state has entered into with Creative Recycling Systems and how all political subdivisions of the state can participate. The deadline of April 1 was discussed for those attendees wanting to apply for equipment or education monies through a recycling grant or a one-time annual event to clear citizen homes of hazardous items such as Drano, oven cleaner or oil-based paints through a HHW grant.